Campitelli and colleagues from The Kent State University College of Podiatric Medicine demonstrate strength related gains to the foot by running in Vibram FiveFingers. For many reasons. I could discuss this for days but the bottom line is the more we use our feet and toes, the stronger they will become. By wearing less of a shoe, we will use our toes to stabilize the foot against the ground and by activating these muscles more often, they become stronger. Simple concept, yet we’ve been missing it for over 40 years by focusing on building the perfect shoe. We already had the perfect shoe, our own foot. We just needed to wake it up and use it. When Vibram created FiveFingers it allowed many individuals, as well as runners, to realize shoes weren’t as important as we once thought. By feeling the ground, our foot can tell the brain which muscles to activate and the foot responds by absorbing shock and working more naturally- the way it was intended to work. Our study demonstrated that by wearing, and even running in Vibram FiveFingers, the abductor hallucis muscle (a major supporting muscle of the arch) became thicker. An increase in muscle mass can be understood as increasing strength. It’s analogous to the change we see in any muscle that gets larger by lifting weights. It becomes larger and stronger. Other studies have found similar results. Less shoe equals more gains in strength to the foot muscles. As muscles become stronger, they become resistant to injury. Those who critique our study will stay that just because the muscle becomes stronger doesn’t necessarily mean it resists injury. Isn’t this what physical therapists have built an entire industry and profession around? We perform physical therapy to become stronger and resist injury. I think it’s pretty safe to say that if we make our foot stronger it will resist injury. If not, why do we send patients to PT who suffer from tendinitis or plantar fasciitis. After all, it’s understood that one of the standard of care treatments for plantar fasciitis is foot strengthening through physical therapy. Initially I was criticized for being on the “medical advisory board” for Vibram FiveFingers and then submitting this study. I would like to clarify my involvement with Vibram USA. I lectured to their staff of sales persons on foot function and running mechanics. I had no involvement in the design of the shoe nor was I employed by Vibram. In fact, I had to miss office hours and reschedule surgeries at times to make trips to Boston for meetings. It was gratifying, though, as I had the opportunity to meet many wonderful people in the running and shoe industry that opened many doors for me and allowed me to understand more about running and shoegear. I was in no way payed off or influenced by Vibram. If you were to look at the shelf in my garage, it’s overflowing with samples of shoes from each and every shoe company besides Vibram. I have worn and run in many different shoes and still test many shoes. There was no bias here. We were just able to figure something out way earlier than most others shoe companies and help change the shoe industry. Many will say that FiveFingers were a fad and have phased out. They changed the shoe industry and were then sued by what were alleged to be false claims of strengthening the foot by wearing there shoes. I think our study came a bit too late. Since their inception in 2005, we saw a record breaking increase in the popularity and sell of this shoe as compared to any other running shoe that has ever hit the market. Then around 2014, we saw a large decrease in the popularity of Vibram FiveFingers. It wasn’t that people stopped wearing them. Two things happened which led to their decline. 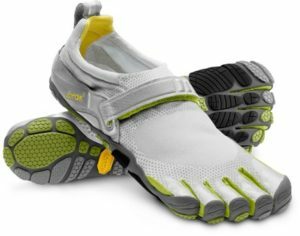 The lawsuit did scare retailers away, but more importantly, many shoe companies have created shoes that were light, flexible, and without a cushioned heel which let the foot function much like it would in FiveFingers. Simply put, more options became available. 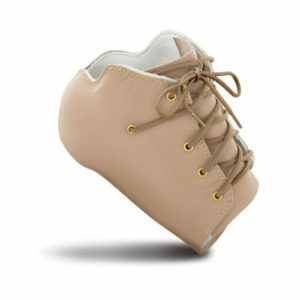 New Balance, Brooks, Nike, Adidas, Skechers, and other large shoe giants created their versions of minimalist like shoes. We saw a change in shoes being created with thick cushioned heels and rigid midsoles to those with flat heels, less cushion and more flexible. Today there are many new shoe companies make only shoes which are minimal in design such as Altra, TopoAthletic, Vivobarefoot, Skora, and Inov-8 to name a few. So what did this study accomplish? Subjects wore the popular Vibram FiveFingers Bikila model. Wearing FiveFingers daily – unrestricted amount of walking in them. Walking in FiveFingers – restricted amount of walking as defined by study. Running in FiveFingers- follow 10% increase in mileage up to 6 miles. Over the designated period of 48 weeks, we collected data in regards to injury, arch height with X-ray, muscle strength with force plate analysis, and muscle girth of the abductor hallucis muscle. We were unable to publish the result of the force plate analysis and muscle strength as a result of variables which could have led to unreliable results. We did see increases in the force that our subjects were applying however. Unfortunately they could not be included in the study. In regards to the radiographs of the subjects, a change in institution resulted in loss of digital files of a select number of subjects which could not be recovered preventing a full analysis of data. 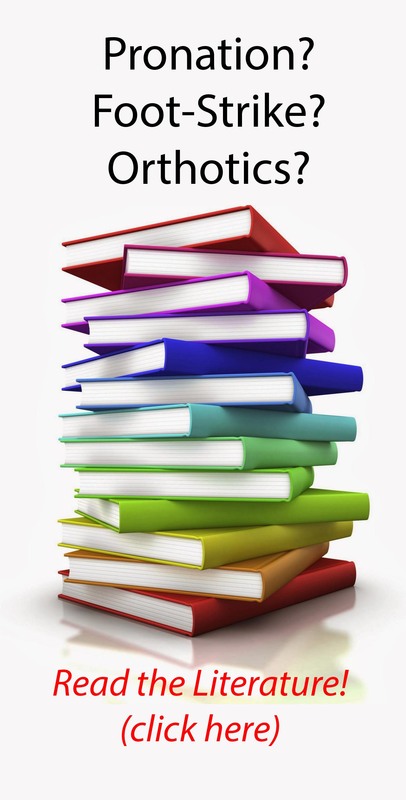 The radiographs were not sent for official reading by a radiologist which resulted in the loss of files. The significant results came from a cross sectional measurement of the abductor hallucis muscle via ultrasound. There were increases in the size of this arch supporting muscle in all three groups of subjects who wore the Vibram FiveFingers. One can extrapolate that from increasing the size of this muscle, strength gains will also be seen. Why did we measure the abductor hallucis muscle? 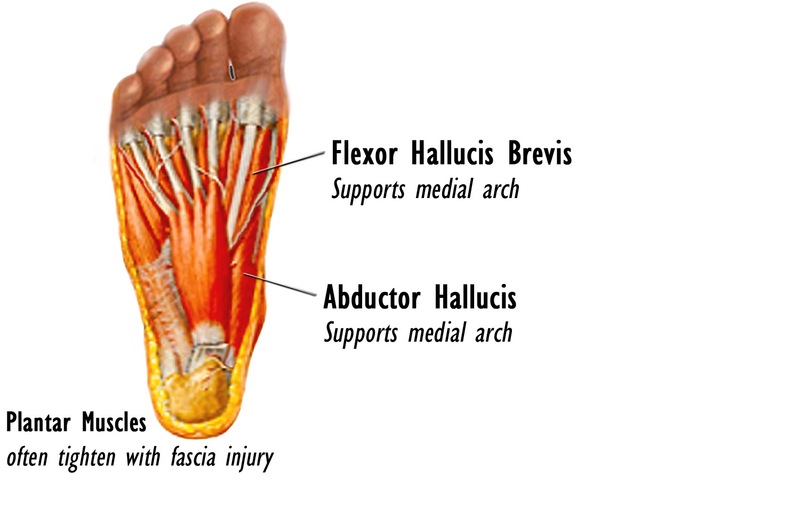 In regards to foot strength, the abductor hallucis muscle is one of the muscles that has the largest muscle mass which makes it accessible for measuring. Other similar studies have looked at the abdcutor hallucis muscle in regards to foot strength. We used to place an emphasis on strengthening of the tibialis posterior muscle which we now know is not as crucial as once believed. The current thought is that the posterior tibial tendon becomes damaged secondary to a breakdown in the arch which occurs from attenuation of the ligaments that support the arch. Weaknesses in the foot muscles may lead to increased stress being placed on these ligaments which eventually leads to collapsing of the arch. This collapse then causes the tibialis posterior muscle to work harder to control the collapsing arch an it ultimately becomes overused and damaged. So, focusing on the strengthening the posterior tibial muscle ignores the true root of the problem which is the weakness of the foot. The abductor hallucis muscle is not the only muscle crucial to foot strength. There are numerous muscles in the foot which are also important. They are just extremely difficult to isolate and measure. The Arizona Mezzo Hybrid ankle foot orthotic. A new way of controlling excessive foot motion. An AFO will control motion in the foot and subtalar joint much greater than a simple shoe orthotic will. In fact, most cases of severe pathologic flat feet will collapse on the orthotic device that is placed into the shoe. An AFO which crosses the ankle joint, is the only true way to control excessive foot motion such “excessive pronation”. We are now seeing orthotic companies producing hybrid type devices which contain laces and wrap around the mid foot and subtalar joint to control motion in the foot. If you think orthotic will fix your running injury or foot pain, it’s highly unlikely. In summary, if you want resolve your plantar fasciitis or “achy” feet, or get over a foot related injury, it is imperative to strengthen your foot. This study helps to prove that by getting out of rigid, motion controlling shoes, one can make their foot stronger and in turn resist injury. 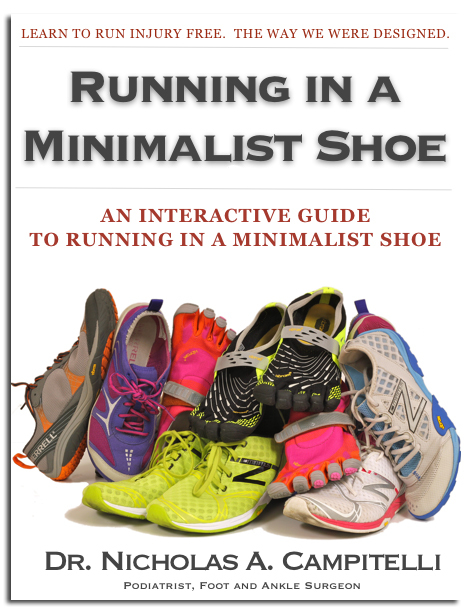 Since we completed this study, I have transitioned numerous runners, as well as non-runners, out of orthotics and rigid shoes and into more natural minimalist type footwear. The response has been tremendous and we are treating local runners as well as runners from all over the United States. Social media has even allowed connection with runners from all over the world. Many of my colleagues from all specialities have helped redirect the running community in the same direction. Mark Cucuzzella, MD, a family physician from West Virginia and runner himself is a leader in the instruction of running form and natural movement. He has lectured all over the world on running injuries and running form. Ray McClanahan, DPM, a podiatrist in Portland, OR is also one of the leaders in foot function. Dr. McClanahan developed a product known as Correct Toes, which is worn in your shoes and fits between your toes to help spay the toes to a more anatomically correct position. Questions? Please post in the comments section below! Strike Patterns in Female Runners. Med Sci Monit. 2015 Jul 13;21:2021-30.
planus and subjects with neutral foot. J Back Musculoskelet Rehabil. 2016 Mar 18. 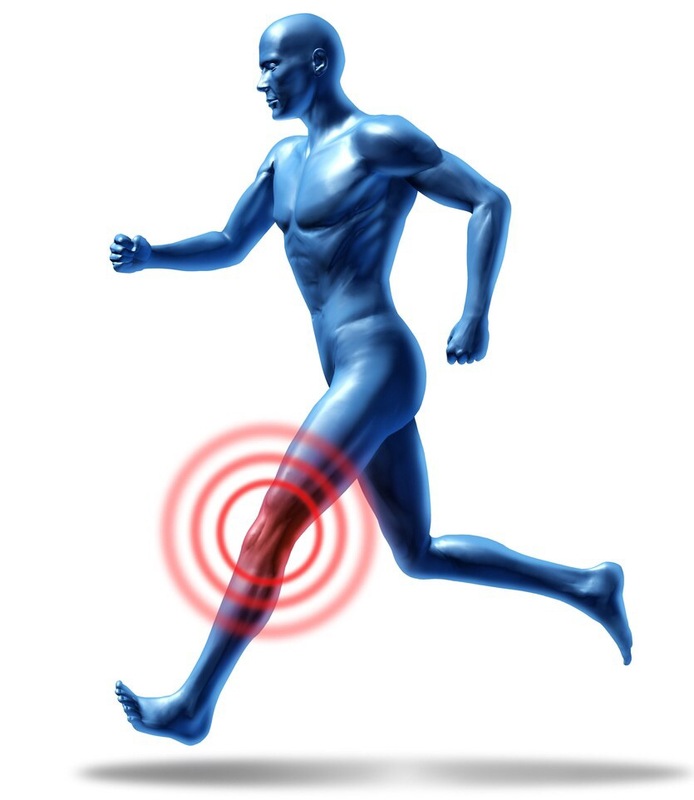 Knee Pain From Running. Runner’s Knee. Love your enthusiasm on this—I share it. I have seen many benefits of minimalist running by my PTT always aches after a few miles. Is this something the ankle orthotic may address? I had been running in rigid orthotics and motion control shoes for 20 plus years—so I know this wouldn’t happen overnight—but this last attempt, is built up very slowly, did tons of balancing exercises and still am getting the achy ankle. Thanks again. I have RA I am trying to decide to keep a pair of these as I (a) have plantar fasciitis and (b) have some toe issues starting from Rheumatoid Arthritis my toes are trying to move. Are these a good item for me to wear to help separate my toes from RA deformity and will these 5 finger shoes help with plantar fasciitis pain. Could these shoes create more pain for me? I have Rheumatoid Arthritis and plantar fasciitis are the five finger shoes right for me. I have bought a pair and have not decided yet to keep them. A) I have plantar fasciitis and I was under the impression these shoes help that condition. B) My toes are starting to move with the RA and I was hoping these shoes may keep that from happening? Please advise?